The Holiday Inn St. Catharines is located in the heart of St. Catharines, Ontario only minutes away from all the fun and excitement downtown. 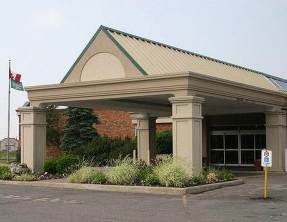 This Niagara hotel is also a short drive away from the Falls and the attractions located in the surrounding area. This St. Catharines Hotel offers some of the best amenities including an indoor/outdoor pool, newly upgraded Health & fitness centre, whirlpool, mini golf on-site, and the Vecera Restaurant is located in the hotel. This Holiday Inn hotel is located in the heart of the Niagara Region, only minutes away from beautiful Niagara Falls and historical Niagara-on-the-lake. The Holiday Inn St. Catharines is surrounded by the renowned golf courses and the award winning VQA wineries located throughout the region. For the business traveler, there is up to 4,242 square feet of meeting space available. Also some of the nearest major corporations and financial institutions include General Motors, TRW, Brock University, Niagara College, Seaway Marine, Dana Corp.
Vecera Restaurant & Bar offers an extensive menu of foods of the world, specializing in Mediterranean Cuisine. Open for breakfast, lunch and dinner. Daily Features, Sunday Brunch and Express Lunch Service offered. A fabulous Saturday Night meal consists of a juicy Prime Rib with Yorkshire Pudding. A specialty of the Express Luncheon Menu are Angus Beef Burgers. At the Holiday Inn St. Catharines Hotel, Eight meeting rooms totaling 4,242 square feet of meeting space are available for the business travelers. An “All-Inclusive Meeting Package” is also available, including Conference meeting room, continental breakfast, continuous all day break service, & working luncheon. For your next meeting at the Holiday Inn St. Catharines, a Sales & Meetings Professional is on site along with amenities such as a 35mm slide projector, DVD Player, Flip Chart and Markers, LCD Projector, Microphone, Whiteboard, Overhead Projector, & Modem Lines.